We are a very creative family! Right from the start, I provided art and craft materials and allowed my children much free time to create daily in our homeschooling, which I believe laid the foundation to their their talent and enjoyment of all things creative. May I encourage you to do the same? 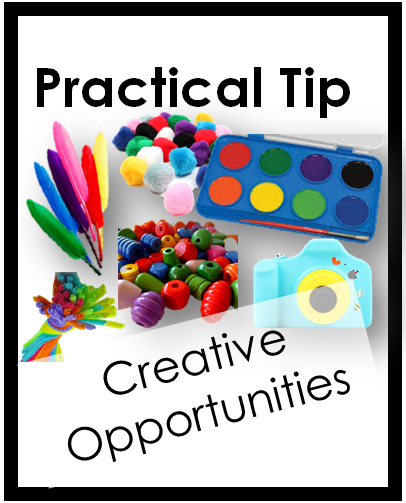 Set up a craft area with supplies to provide creative opportunities for your children. This is especially good for hands-on activities while the children listen to a read alouds, or for handicraft time in the afternoons. Art and craft supplies need not be expensive. I started our collection with a cheap craft purchase here and there each month, and added new, interesting items to our stash to keep my kids excited and stimulated. I stored these items in Ziploc bags in plastic suitcases, placed in an easily accessible area on the bookshelf. Read how I organized our art supplies here. It is worth spending a while clearly and simply demonstrating to your children how to work with the materials, how to take care with specific things, how to clean up and pack away. Establishing foundation skills with each activity prevents the mess and chaos that most moms hate and therefore avoid doing art and crafts. Purchase some plastic sheeting or cheap painter’s drop cloths to cover the floor if working with messy things. Insist that your children wear an old over-sized T-shirt (my kids loved wearing their dad’s T-shirts) or art smocks or aprons over their clothes. You can even make aprons out of plastic bags. Set a limit where the activity can take place. Children may only work in a specific room, on specific tables or floors. Don’t encourage them to wander around with the supplies. Remind your children to wash paint brushes, close glue tops, pack away when done. Lastly, provide a lovely gallery to display their works of art. Check out all my art ideas, lesson plans and free downloads on my Art Page. Have you got any creativity ideas to share with us? Please share in the comments below. Here’s wishing you and your family hours and days of fun and creativity!